Those 90 degree valve stems are nice. I have them on my Indian, much easier to check and inflate tires. Yep, I put them on any bike i get. The Girlfriends oldest boy is about to replace the tires on his GSXR-750 and i showed them to him so he's going to order a set to have installed. Only 3k??? that sounds really weird to me... I put 7k+ on stock Dunlop before I thought I should replace them. There were couple of mm to the wear markers left, but I just wanted to throw them away to install Angel GTs. I must say, I'm not a small guy, I think I'm like 300lbs(135kg) all geared up. My riding is mostly weekend trips 150-300 miles backroads/twisties/highways + commuting 2-3 days a week. So central part of my tires gets a lot of work. I thought Michelin PR4 should've lasted longer than stock Dunlop. The only thing comes to my mind is over inflation. You miss 100% of the shots you don't take. Wayne Gretzky. After having been run at a pressure of 38 ft-lbs for 14816 km (9206 miles), the rear BT023 on my 2015 Versys 650 is now down to the wear bars. Since Bridgestone has discontinued the BT023 , I have ordered a Dunlop Sportmax Roadsmart III. My current 023 on the rear will probably last a total 5k miles. This is my fourth 023 and will be the longest one of these lasted. One I pulled at 3k for a trip, has maybe 1k left, the other two I pulled at 4k and 4.5k miles(almost smooth on the 4.5). I'm thinkin' we may have different riding styles. Almost all of my miles have grade changes and twisties and this bike is so much fun to play with in those locations. North GA, NC, AR, and the Rocky Mountain states. BTY, I run between 38 to 42lbs pressure depending on load. I have a set of Roadsmart III's in the garage for the next go. I'm sure that we do Steve. At this period of my life, I now prefer relaxed touring, etc. I now tend to choose rides with more sweepers than twisties, etc. This was not always the case LOL! I used to ride with 40 lbs pressure in the front and 42 lbs pressure at the rear on my Valkyrie. I tried 40 lbs on the rear of my Versys but it felt like I was riding on wooden wheels. I then chose to use 38 at the rear and 34 at the front. I'm anxious to see if you like them as much as the BT023s. I hope so because I really like the BT023. I replaced PR4 rear with a Roadsmart III. The Michelins were (are) the best rain tire I've ever used but the rear got a bit squirrely after ~3,500 miles. I replaced it a little over 6,000 miles in use. I like the RS III so far. It seems more solid feeling than the PR4 when riding briskly. Still using the PR4 up front and the unmatched set work pretty well together. The PR4 rear still had usable tread when replaced but the heavily grooved area off vertical was feathered-up on the leading edge (sorry no photos). Original Dunlops went for 4,300 before cord showed. I recently put on a set of Roadsmart 3's. I was looking for better life than I got from the D222's, which squared off in about 2,800 miles. So far I like the Roadsmarts very much. Wet grip seems much better. We'll see how they wear. Had a question for anybody else out there on the Roadsmart 3, have you noticed them making more road noise? Mine sound like truck tires going down the road in comparison to the D222's. So much so that I'm wondering if I could have done something wrong during installation. I'm assuming it's simply due to the different tread pattern / deeper tread depth, but not sure. Whatever the reason, I've got about 1,000 miles on them and the noise persists. 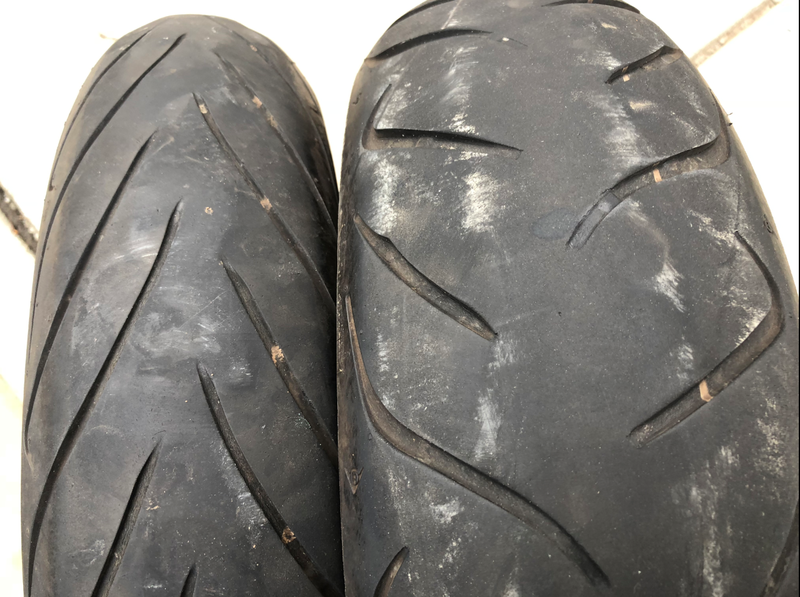 Shinko 705 - 1650 miles - tire has about 65% of tire life left. Used this tire through winter. Horrendous handling due to weight. Switched to better tire for summer riding. Will finish the rest this winter. Bridgestone BT023 - I have 1300 miles on the current tire. Close to half gone. I have a pair of SHINKO E705s on my '08 - a 130/80 rear on the front (presently w/ just OVER 9,000 miles on it [the one I replaced had 28,799 MILES!]) while the 150/70 on the rear has OVER 11,000 miles on it, and it'll be changed in the next month or two. Being in AZ, my tires don't see a lot of rain, but I find their 'handling' to be VG on ALL surfaces, altho' I do NOT try to "drag-a-knee". My BC bike (also on E705s) sees SOME rain, and I've never "tip-toed" in the rain w/ it. BTW - I run 36psi F, 42psi R on ALL surfaces! I'm surprised by the high tire pressures being run by some forum members. I always understood higher pressures were not recommended for aggressive cornering. For example, when I have gone to track days (once with my 2016 Versys), each time they instructed us to run 31psi front/30psi rear. I assume the thinking is that with lower pressures, one gets more rubber on the road and therefore more grip, which makes sense to me. Same thinking when driving a car in snow. Thanks, Invader. That's a helpful article. I will continue to keep my tires at the recommended pressure for normal street riding, but never higher than those values. I use road 4 GT get around 8000 miles on them. GT is harder rubber, which means slower heat up time. Heat is love hate relationship. If you not riding that much only summer season and your ambien temperature normally above 60 F degrees. Would recommend road race tires, they take a little bit more to even heat up but when the tire is around 120F + start to be nice and sticky. Try road 4GT and run 42 PSI, really good for all season riding and always heat them tires up before riding hard. If you only do short trips run 34 PSI. If you feel daring and only ride on pavement switch to 170/60/17 road 4 GT on 42PSI I get around 10000 miles, this set up require more skill from the rider. Your front tire should last around 14000 miles = 2 Rear tire change before front needs to be changed. After that switch to Road 5 better grip in sunny season than road 4. Some of these are within the motorcyclist’s control: tire pressure, load, vehicle speed, riding style (braking and accelerating). A single factor on its own may have only a small impact on a tire's mileage; however, if many factors come together there will be much more wear and tear. Most of a tire's grip on the road comes from the treads. As they wear down, they lose their ability to drain away water. It is therefore important to ride more slowly on wet surfaces.